Imagine you are a great horned owlet and you find yourself stranded on the ground unable to defend yourself from predators or hunt for your own food. Pretty Frightening! Now, imagine that you (as a human) come across two such owlets. What do you do? Well that was the question Cheryl Aguiar had to answer when she was faced with that exact situation. With the help of her husband, Cheryl attempted to relocate the owlets and provide the entire family with a new nest site. Find out how this dangerous experiment turns out! A true story, Cheryl Aguiar documents the fascinating experience she had with a family of great horned owls. When a pair of owls begin nesting in the woods behind her home, she patiently awaits the arrival of their chicks. When they hatch, Cheryl becomes captivated by the two, fluffy owlets. Sadly, misfortune befalls when their nest is destroyed and the owlets are hurled from safety. 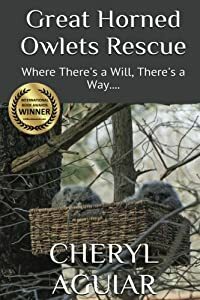 Unable to ignore the plight, Cheryl and her husband attempt the dangerous task of relocating the owlets and provide the entire family with a new home in the most ingenious way without removing the owlets from the care of their parents. These intelligent birds also known as raptors, with a reputation of being extremely aggressive, show a different side when faced with sudden adversity and befriend Cheryl in the most astonishing manner. A story of love, trust, respect and the gift of gratitude. A Narrative Non-Fiction / Personal Memoir story about the rescue of two adorable Great Horned Owlets and their strong-willed, devoted parents. A heartwarming story of trust, love, respect and the gift of gratitude. Deaf dogs are often mistreated, abandoned, or even destroyed. 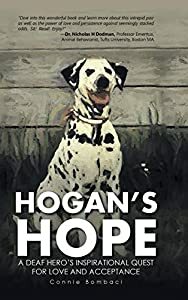 Hogan's Hope is the tale of a legendary deaf canine hero who, after being rescued from severe abuse, prevailed as he learned American Sign Language and provided the hope of life, not death, for deaf dogs worldwide. 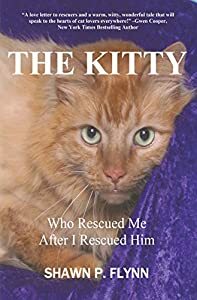 His courage to overcome prejudices and myths continues to provide inspiration to anyone - human or pet - that success and genuine love are truly possible. This valiant deaf dog reveals that by choosing hope anyone's dreams can come true and the world can be filled with steadfast faith, pure joy, and unconditional love. 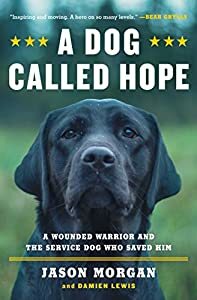 Hogan's Hope, like the book Tuesday's Promise by New York Times bestselling author, Luis Carlos Montalvan, shares the deep devotion and dedicated bond between Hogan and his human. Hogan touches the soul and encourages people to find real love and meaning in their lives despite any challenge. Similar to Hannah in Devoted, Hogan inspires readers to examine their hearts, discover the faithfulness of true and meaningful relationships, and learn from the loyalty of our four-legged heroes. And, by discovering a new world beyond the door of the metal cage, some say that he's similar to Lucy in The Chronicles of Narnia and The Little Prince searching each adventure with great anticipation. He met each new day as a wonderful adventure to learn, to accept, and to hope. His purpose in life was to love his human with indescribable adoration and to promote hope, no matter what. Hogan's fame spread through television shows such as Oprah Winfrey, Jack Hanna's Animal Adventures, Dateline, Amazing Tails, National Geographic, and Good Morning America. Perfect for fans of Gwen Cooper's Homer's Odyssey: A Fearless Feline Tale, or How I Learned About Love and Life with a Blind Wonder Cat, John Grogan's Marley & Me: Life and Love with the World's Worst Dog, or Vicki Myron's Dewey: The Small-Town Library Cat Who Touched the World. The hu-amorous true story of an animal-phobic, city robotics engineer who learns too late that his new bride's dream is to have a farm where she can rescue ex-racehorses. When the couple takes a Meyers-Briggs Personality Test for fun, it tells them that their marriage is doomed. There is only one problem: they took the test after the wedding. Buy now and enjoy the multi-award winning stories of one man's journey along the bumpy road from his urban robotics lab to his new life on a rural Virginia farm. - Bret Witter, #1 New York Times bestseller co-author of Dewey [the Library Cat]"
Living with wolves has provided Tracy with countless experiences that have changed her life in unimaginable ways. As a cofounder of Mission: Wolf, a wolf sanctuary in Colorado, Tracy has spent half her life studying wolf behavior and body language. Tracy has learned to leash train and walk wolves, often with painful consequences. Join Tracy as she develops a special bond with an intense British Columbian gray wolf named Shaman. Shaman becomes a great wolf teacher, and eventually the shy wolf grows to trust her. Tracy relies on her instinct and intuition as she moves to calm sensitive wolves like Shaman. She does well but believes in her heart that she can do better. A horse named Ikus comes into Tracy’s life and dramatically changes her understanding of horse-to-person communication. Driven to find her own way to connect with horses, Ikus becomes a professor in nature’s university as Tracy embarks on a journey of learning to speak horse language. 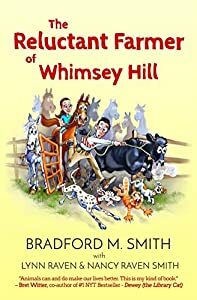 Something profound happens when Ikus, a horse with an attitude and a dislike of being haltered, gives Tracy an unexpected lesson in resolving feral behavior. 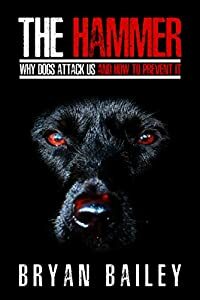 Not only does Ikus teach Tracy how to stop his run-away glitch but Tracy discovers a missing link in her previous wolf-handling life that will forever change her approach to resolving feral behavioral problems in both species. This experience ultimately provides Tracy with a foundation for clear communication, and it awakens in her an effective and natural way to connect with animals. Tracy’s world of wolves and horses is forever inspired as she moves to a new level of connection beyond anything she believed possible, and she strives to share what she has learned. Sally, a young woman from the UK, comes to volunteer at the sanctuary and learns to calm a very frightened eighteen-year-old horse who is going blind and in danger of injuring himself. International Book Awards Finalist 2016. Reader’s Favorite Book Awards Finalist 2016. 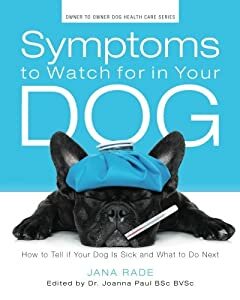 Winner Best Book Awards Animals/Pets General Category 2016.